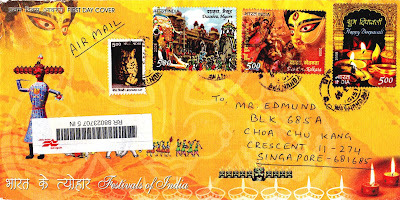 eD@HoMe: A colourful cover from India! Today, I would like to share with you this very colourful cover that I received from India recently. Many thanks to Jyoti for sending me this great gift. On this lovely cover are 3 stamps from the "Festivals" series, issued in 2008. From left to right, the stamps depict Dussehra in Mysore, Dussehra in Kolkata and Diwali or Deepavali. You can read more on these stamps in my previous post. 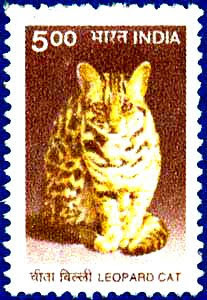 The singular stamp on the cover shows a Leopard cat. It belongs to a set of 2 stamps from the "Cats of India" series, issued in 2000. 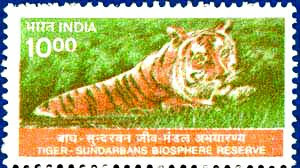 The other stamp in this set depicts a tiger in Sundarbans Biosphere Reserve. A UNESCO World Heritage Site, the Sundarbans Reserve is the world's largest mangrove ecosystem, stretching across coastal India and Bangladesh, over the northern part of the Bay of Bengal. 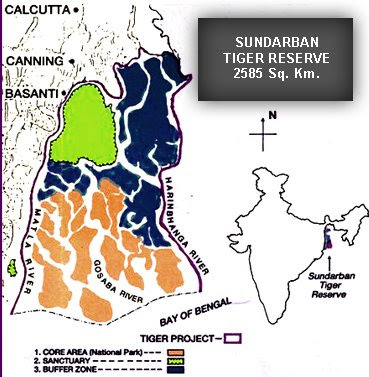 This region is densely covered by mangrove forests, and is one of the largest reserves of the Bengal tiger. It is also home to a variety of bird, reptile and invertebrate species, including the salt-water crocodile. Pls enjoy this lovely cover on this beautiful day!